Living a Fit and Full Life: Bring Back the Lost Luxury of Bath Time with Luxe by Mr. Bubble! Bring Back the Lost Luxury of Bath Time with Luxe by Mr. Bubble! Pamper, relax and refresh with bath and body essentials designed to help you escape the day. Authentically retro and stylishly fun, Luxe re-introduces your favorite Original Bubble scent from childhood, adding a happy and nostalgic twist to your bath time routine. Resurrecting the beloved powdered bubble bath and introducing new products like Bubbletini Bath Bombs, Just a Spritz Fragrance Mist and Shine On Lip Balm, Luxe by Mr. Bubble is bringing back the lost luxury of bath time. And this time, no kids allowed! Time to shake up your bath routine! Sink into a warm, soothing bath and let your skin drink in the moisturizing benefits of Jojoba and Shea Butter. The blend of Epsom and Sea Salt is the perfect cocktail to help you cast away your skin’s impurities while Vitamin E and Aloe nourish and protect your pretty little self. Your neighbor will definitely want to borrow this kind of sugar! Treat your body to a luxurious lotion sugar scrub that exfoliates dry skin while the powerful trio of Jojoba, Shea Butter and Coconut Oil nourish and moisturize. Bring back the lost luxury of bath time with Luxe by Mr. Bubble! As a mom of 4 taking a relaxing hot bath isn't always easy but it's one of my favorite ways to relax and regroup. When I have a bad day, a hot relaxing usually makes everything better. Luxe by Mr. Bubble makes bath time even more relaxing than ever with their super fun bath products. On the Rocks Sea Salt Body Soak is the perfect way to relax while moisturizing and softening your skin to perfection. After I used On the Rocks Sea Salt Body Soak I was relaxed and ready for bed. My skin also felt incredibly soft and hydrated. Give Me Some Sugar Triple Moisture Sugar Scrub exfoliates dry skin while the powerful trio of Jojoba, Shea Butter and Coconut Oil nourish and moisturize. I used this on my legs before shaving and oh my word my legs were the smoothest and softest they've probably ever been! Milk & Cookies Tub Time Retreat Gift Set is an amazing gift set and to be completely honest, I'd prefer these milk and cookie bath items to real milk and cookies any day. 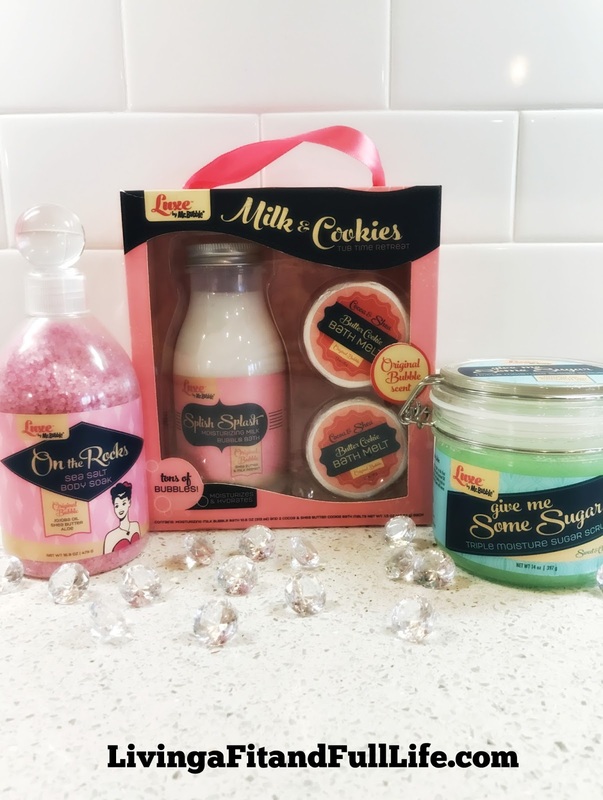 Milk & Cookies Tub Time Retreat Gift Set is the perfect way to treat yourself to a relaxing bath and take some much needed "me" time! Luxe by Mr. Bubble has a terrific selection of bath products that you will surely love! Luxe by Mr. Bubble Soak and Salts are at currently sold at Ulta Beauty! Luxe by Mr. Bubble Milk and Cookies will be available at Target stores starting in November!